The failure of Congress to pass a budget or even a continuing resolution – besides shutting down many government services for several weeks – means that Congress also failed to approve an extension of the excise fee that funds the Black Lung Disability Trust Fund. The fund is now on a path to insolvency unless Congress acts. 1) Call Senator McConnell at 202-224-2541. You may also try getting through to one of his Kentucky offices: Louisville (502- 582-6304); Lexington (859-224-8286); Bowling Green (270-781-1673); Fort Wright (859-578-0188; Paducah (270-442-4554); or London (606-864-2026). Strengthen funding for the federal Black Lung Disability Trust Fund by keeping the coal excise fee at its current level. This fee dropped by more than half at the end of December, putting the black lung benefits fund at risk. This is the most immediate action Congress can take. Pass the bipartisan RECLAIM Act to invest $1 billion in creating thousands of good jobs while reclaiming old mine sites and polluted waterways and supporting economic development initiatives in affected communities. Pass the bipartisan American Miners Pension Act to protect the pensions of retired union miners and their surviving spouses and prevent a cascading pension crisis in funds affecting millions of U.S. workers. 2) Then, if possible, call Senator Rand Paul to leave the same message. His numbers are: 202-224-4343 (Washington) or 270-782-8303 (Bowling Green). 3) Finally, call your US representative from the list below with the same message. Urgent action is needed to strengthen funding for the Black Lung Disability Trust Fund, a federal fund that provides health and other benefits to miners with black lung disease who worked for coal companies that have gone bankrupt. Unless Congress takes immediate action, the tax on coal that funds those benefits is scheduled to drop by more than half at the end of this month. Senator McConnell could, if he chose, fight to make sure that sick miners' are protected as part of the budget deal that Congress is working to pass before going home. The Black Lung Association of Southeastern Kentucky is planning a peaceful demonstration outside Senator McConnell's office in London, Kentucky on Wednesday, December 19, at 1:30 p.m. to demand action. Community members are encouraged to participate in this action if you can, and to call Senator McConnell's office early and often this week. Kentuckians, including many miners with black lung disease and close family members of sick miners, traveled to Washington, DC twice this fall with delegations from at least 8 states to meet with our Congressional representatives. Two weeks ago, they delivered scores of petitions, postcards, resolutions and letters of support for strengthening the Black Lung Disability Trust Fund, passing the RECLAIM Act, and protecting miners’ pensions. Simultaneously, other KFTC members, including retired coal miners and affected family members, met with Senator McConnell’s staff in London to deliver and amplify the same message. Rates of black lung disease have hit a 25-year high in Central Appalachia. Here in Kentucky, the share of veteran miners with black lung has tripled since 2000. 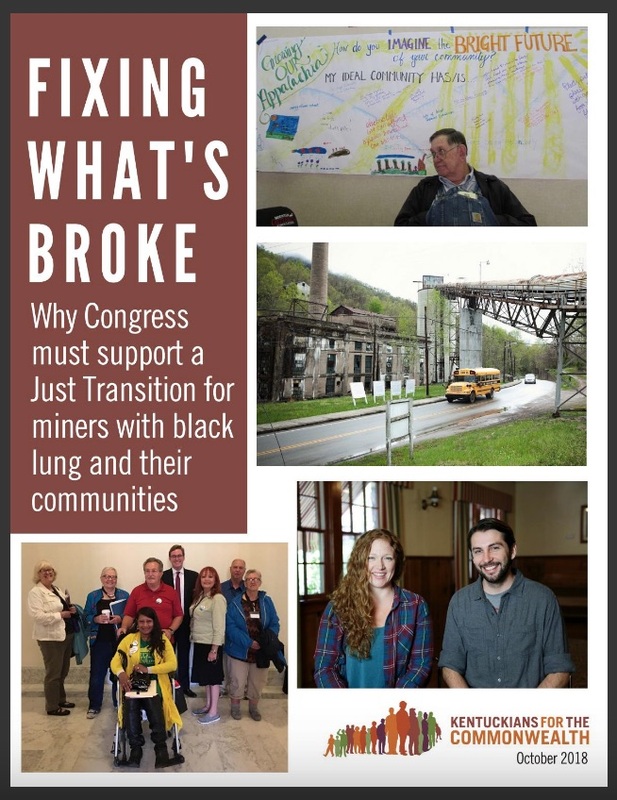 But unless Congress takes action before the end of December 2018, major financial problems face the Black Lung Disability Trust Fund, which provides health and other benefits to coal miners and their surviving dependents in cases where the miners’ employer has gone bankrupt. At the same time, the RECLAIM Act (HR 1731) has stalled in Congress despite broad bipartisan support. This bill is a powerful step toward revitalizing communities hit hardest by the coal industry’s downturn. It commits $1 billion to create meaningful jobs while cleaning up abandoned mines and polluted waterways while supporting economic development initiatives in affected communities. Congress has also failed to protect the hard-earned pensions of union miners who worked for companies now bankrupt. According to the United Mine Workers of America, a federal fund that guarantees pensions for nearly 90,000 retired miners is at risk of insolvency. If Congress does not shore up the miners’ pension fund, the crisis could tip off a cascade of problems affecting pensions for millions of U.S. workers. Thank you for supporting this campaign by calling Sen. McConnell and other members of Congress today to demand passage of these three important bills before Congress heads home for the holidays.